A large number of people lined up in beef party to protest against the Centre’s recent notification banning sale of cattle for slaughter. Rajnath Singh, Union Home Minister, was in Mizoram to attend a meeting of the Chief Ministers of four northeastern states. He said the Centre will not impose any restrictions on people’s choice of food. Few days back, Venkaiah Naidu, Union Miniter, also assured the same following the criticism by several states that the Centre, through its new rules on cattle trade, was interfering in the people’s choice of food, which is a fundamental right. 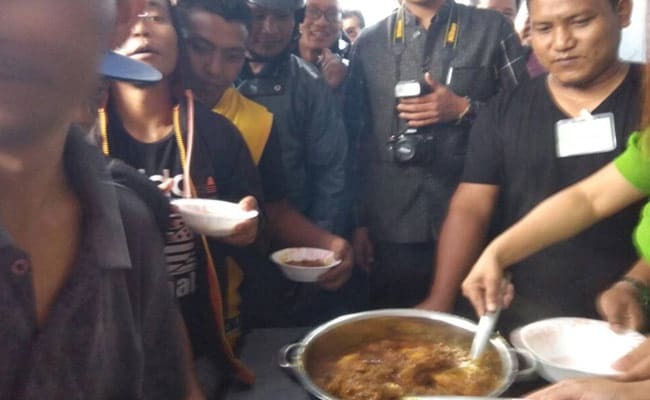 However scores of people in the Mizoram capital participated in a “beef ban bashing banquet” organised by a Zolife Group and other activists. Thousands were gathered and had braced heavy rainfall at Vanapa Hall where the festival was held. Lalrinfela Hauhnar, a member of the group, said a feast in Mizoram was incomplete without beef on the menu. Another member, Lalremruata Varte, clarified that the festival was a symbolic protest and not meant to hurt the sentiment of Hindus. In another backlash, more than 5,000 Bharatiya Janata Party youth workers quit the party on 8th June after Centre’s imposed new rules on cattle sale for slaughter in animal markets.